Leaked teaser video from Samsung Viewnam shows new foldable smartphone. LetsGoDigital brings the phone in full view and shows exclusive 3D renders. 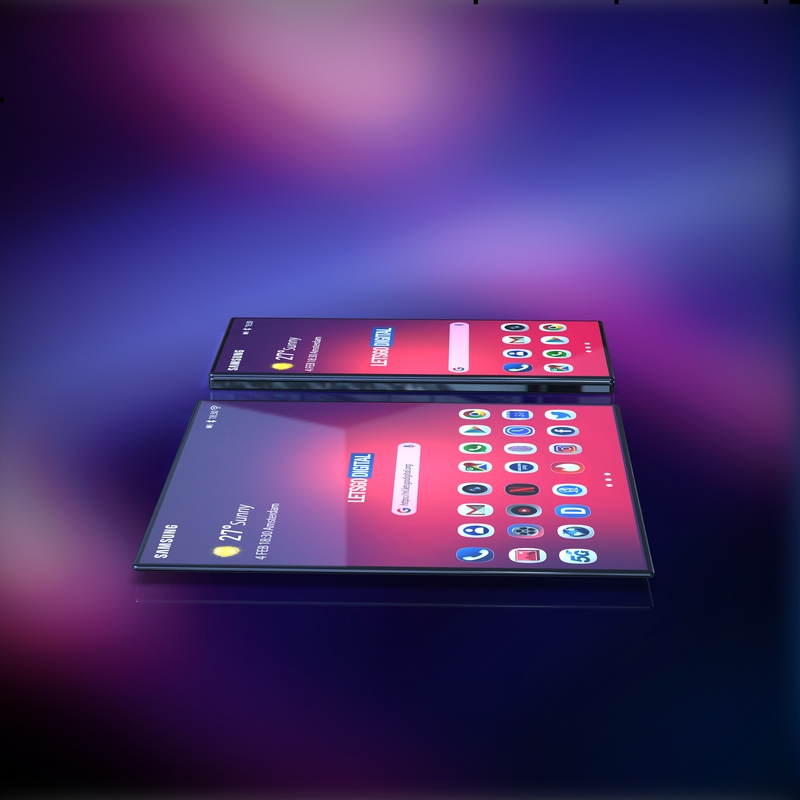 hardly can not have missed it, later this month Samsung will most likely introduce their first foldable smartphone, the Galaxy F (or Galaxy Fold), in addition to the Galaxy S10 series. 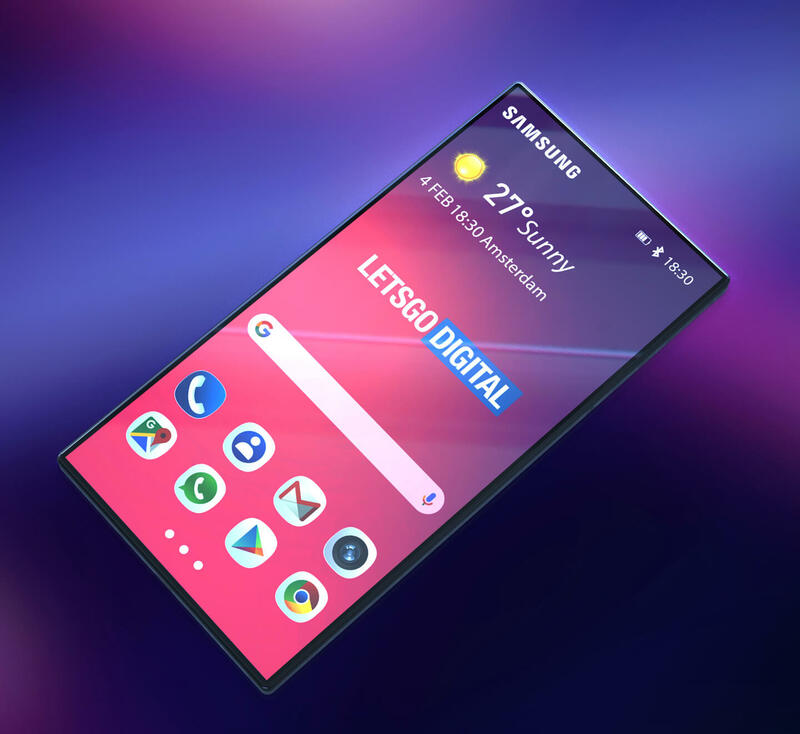 Last week, an official teaser video surfaced on the YouTube channel of Samsung Vietnam showing a foldable Samsung Galaxy smartphone. 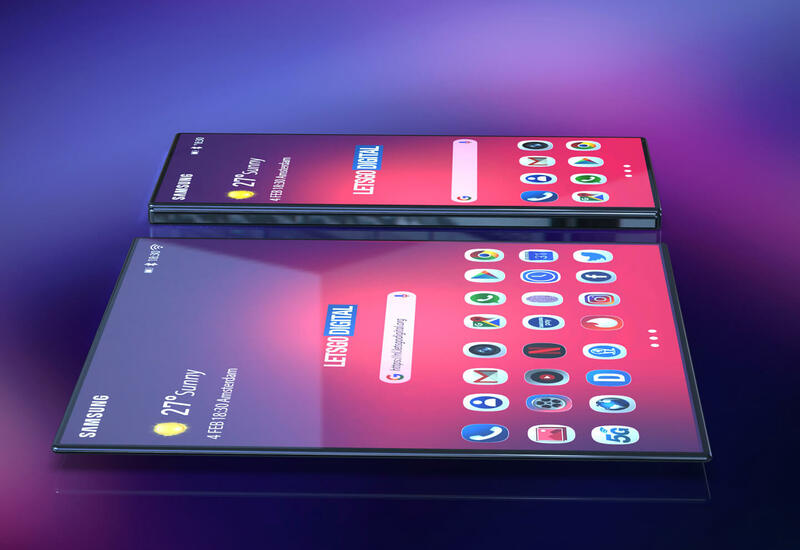 Will this be the revolutionary phone with flexible display that the Korean manufacturer will reveal in just two weeks from now? LetsGoDigital has analyzed and studied the video accurately. 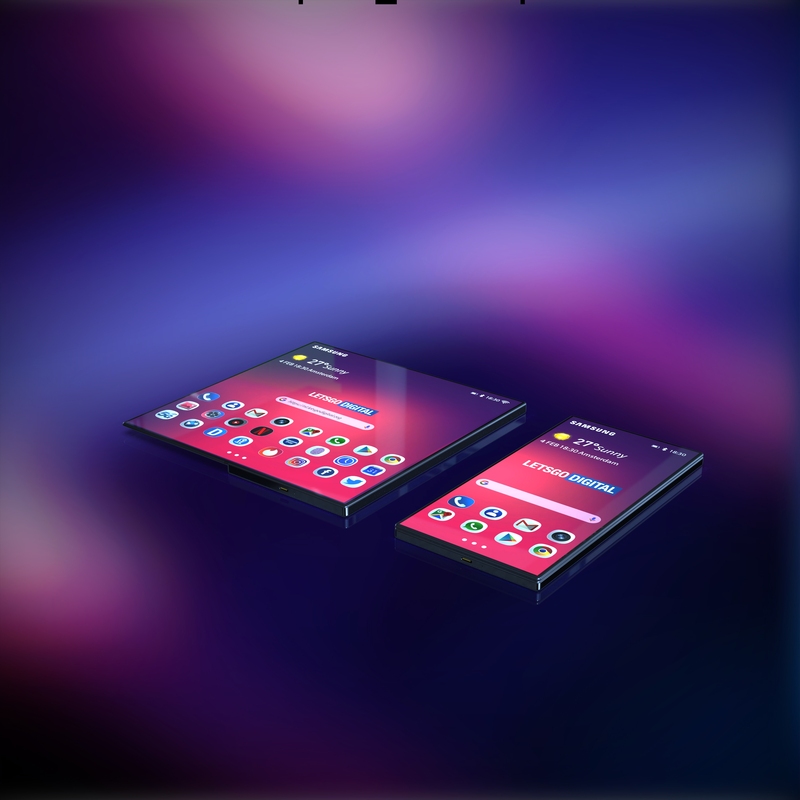 Our 3D specialists have created a professional 3D visualization of the foldable Samsung smartphone, based on the device of which we have seen a glimpse in the teaser video. We have noticed a number of noteworthy differences between the foldable smartphone that can be seen in the teaser video and the mobile device that was shown at the Samsung Developer Conference last November. At the time, the smartphone housing was not clearly visible due to a dummy-cover, you could only see the flexible display and not the design of the phone itself. LetsGoDigital already brought you some 3D renders of this foldable smartphone last year. What immediately strikes you when watching the teaser video is the thickness of the device. The Samsung Galaxy F seems to be paper thin. Justin Denison, senior vice president of Samsung’s Mobile Product Marketing, has already revealed at the Developer Conference that the screen will be thinner than ever before. The polarizer has been made 45% thinner, this layer largely determines the thickness of the display. You can also notice that four icons are displayed next to each other on the start screen, when the device is folded. This is remarkable, because the foldable smartphone that Justin Denison had in his hands showed five icons in a row. 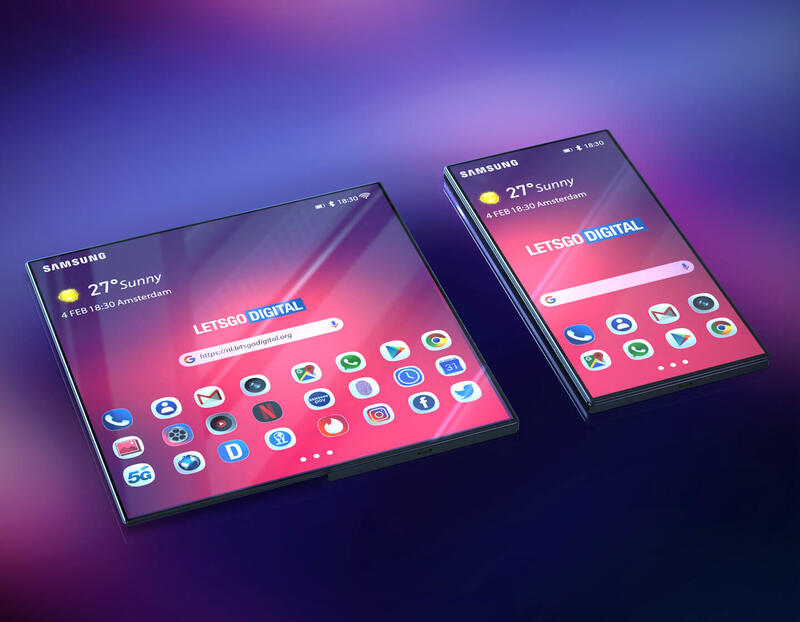 The web page of Samsung One UI, the user interface for Samsung’s folding smartphone, also shows four icons in a row – just like in the teaser video. Another difference that catches the eye even more clearly is of course the front-display. The device that was shown at the Developer Conference had significantly thicker bezels. 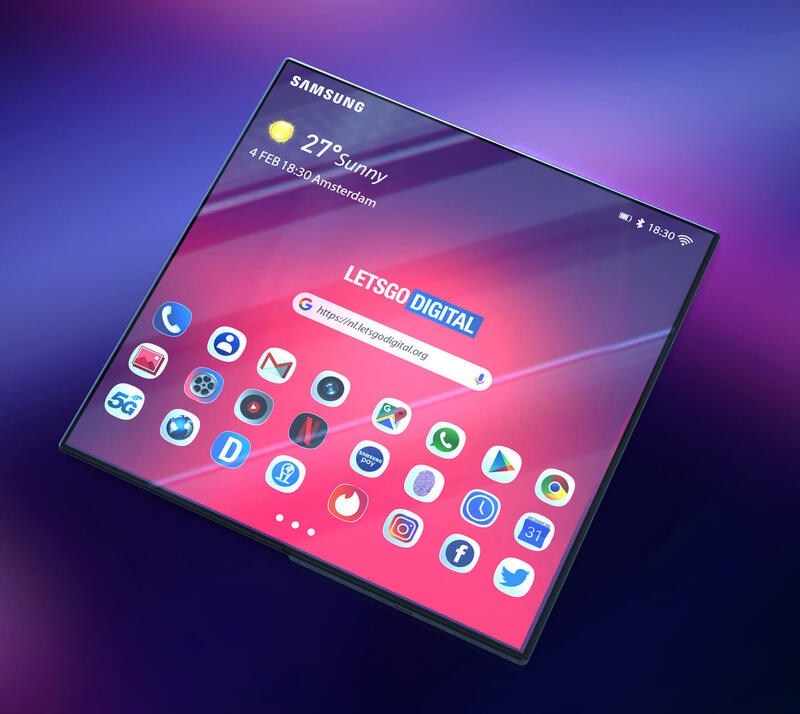 While the foldable smartphone in the Samsung video shows a full-screen display, much more in line with the phones that are presented today. 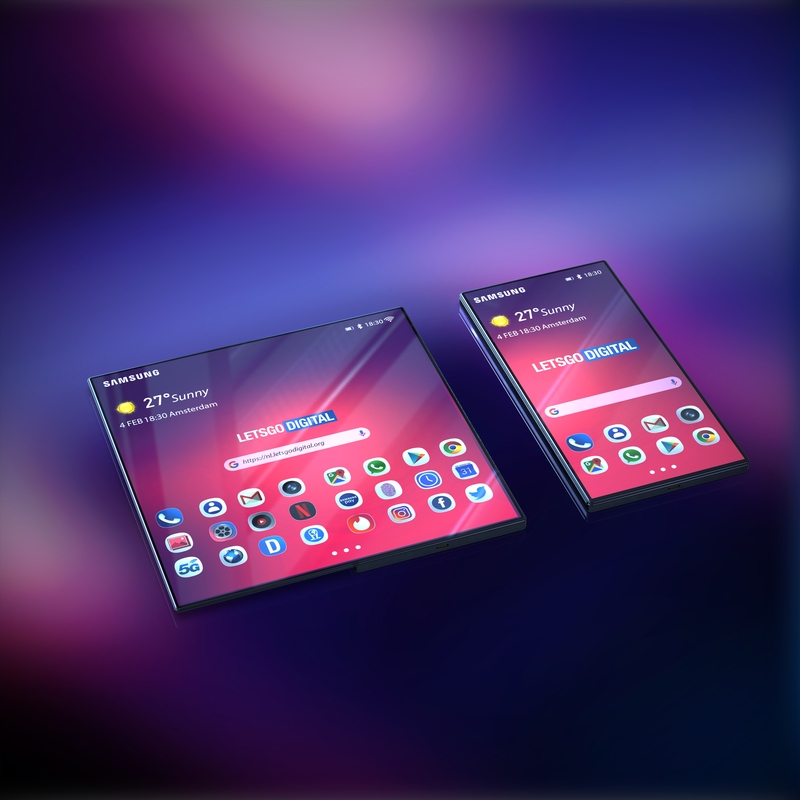 In November 2018 Justin Denison told the Samsung Galaxy foldable smartphone will be equipped with a 4,58-inch front-display (840×1960 pixels). The phone folds open to a 7.3-inch tablet with QXGA + resolution (1536×2152 pixels). What does this mean? Perhaps Samsung will double surprise us at the end of this month by sayng; ‘Here is our foldable smartphone, by the way, we have also decided to make the front-display considerably bigger, you are sure going to like this’. 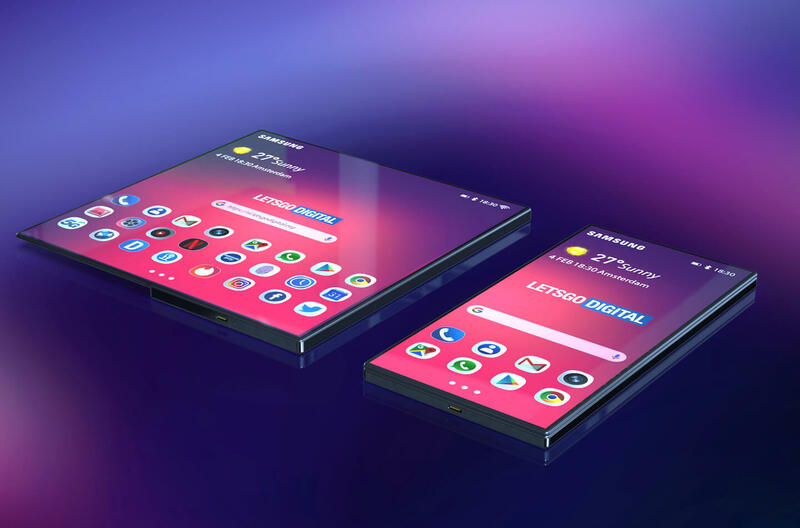 Or we are looking at a teaser video of a future foldable Samsung smartphone. I certainly do not want to exclude this last option. 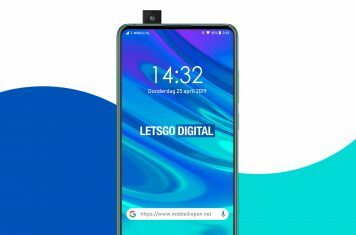 Especially since the video shows more smartphone models which have not yet been introduced, including a future Galaxy Note and Galaxy S-series smartphone, both featuring a New Infinity display. 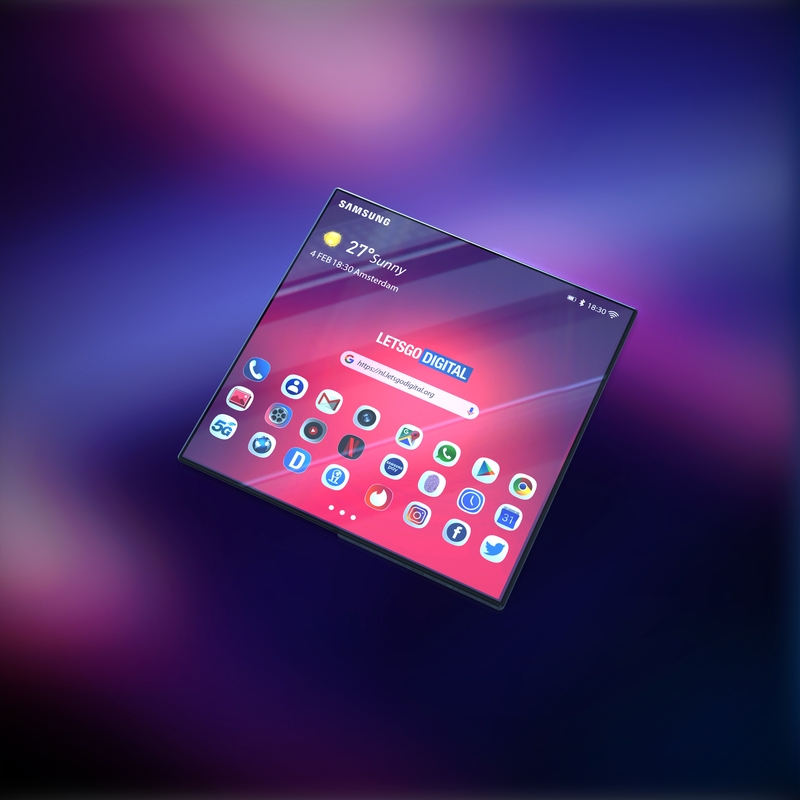 The New Infinity display was also announced at the Developer Conference 2018, but so far no Galaxy smartphones have been introduced with this type of screen. 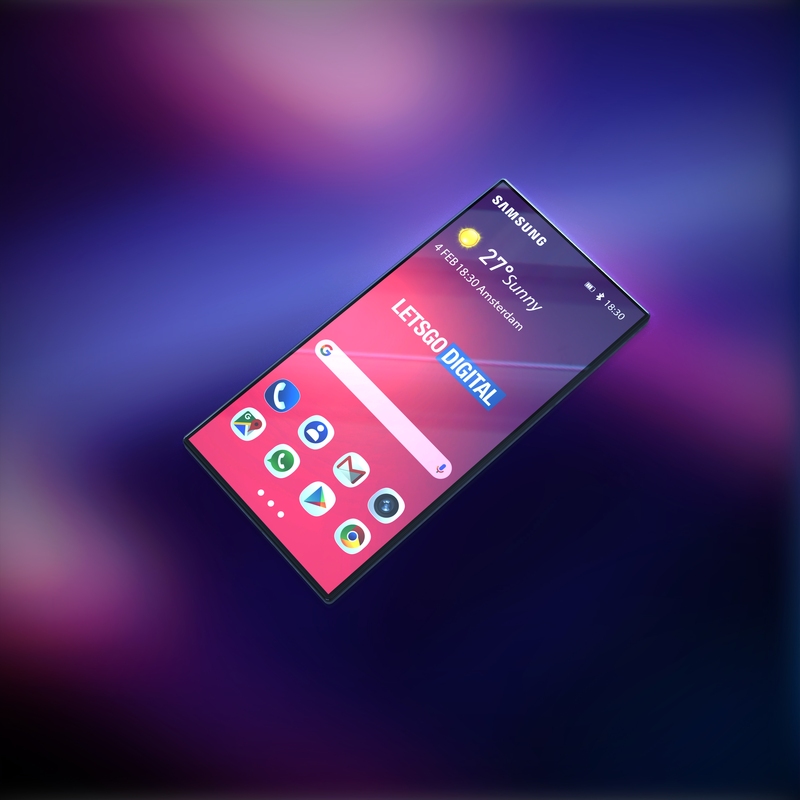 The Galaxy S10 will have a Infinity-O display with a hole-punch camera, perhaps the Galaxy Note 10 will be the first Samsung smartphone to sport a New Infinity display. If the teaser video indeed shows a future Samsung foldable smartphone, then it remains the question why Samsung leaked this video exactly now, less than a month before the introduction of the revolutionary Galaxy F takes place. If everyone can already take a look at the model we can buy next year, more people will probably decide to skip the first generation Galaxy F and wait another year. 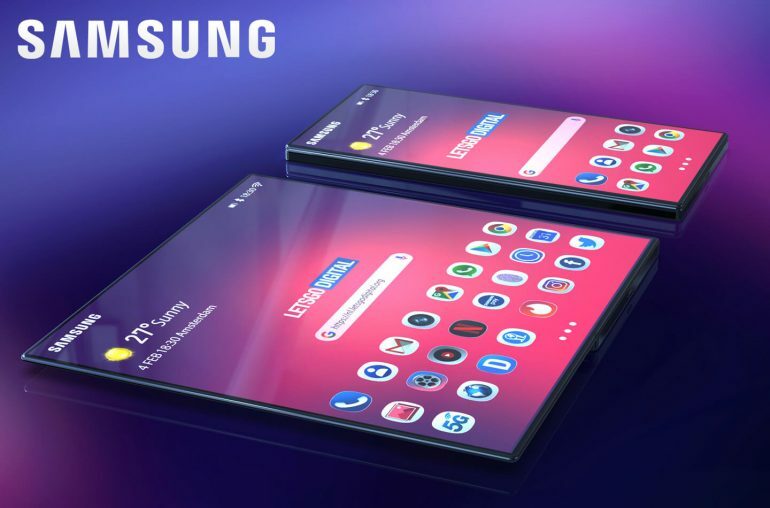 But perhaps Samsung does not really mind, as there will be only a limited batch available of the foldable smartphone any way. After all, it is a nice branding video for Samsung, it shows where the company will be heading to in the coming period. Anyway, I actually want to say, Samsung #DoWhatYouCant and present us the smartphone on the teaser video, it certainly looks stunning! Note to editors: The 3D renders presented in this article are copyright protected and designed by LetsGoDigital. The images can be used for reproduction in any online publication if you add a credit source link to our website. Producing render artwork takes a lot of time and effort, we therefore ask you to respect this rule. Thank you very much for understanding.